I can’t believe I’ve been writing this monthly segment for a year! But more importantly, I can’t believe it’s taken me this long to write about matcha, or Japanese green tea. Matcha is a staple in my kitchen. I enjoy a cup in the morning or use it for baking. Matcha is a bitter green tea that turns into a brilliant light green froth when whisked. It’s unique because the tea is not steeped in water but ground to a powder. The best quality tea is shade-grown and then the smallest leaves are collected and ground to a powder. High quality matcha tends to be very bright green while lower grades (typically used for baking) are not as bright. 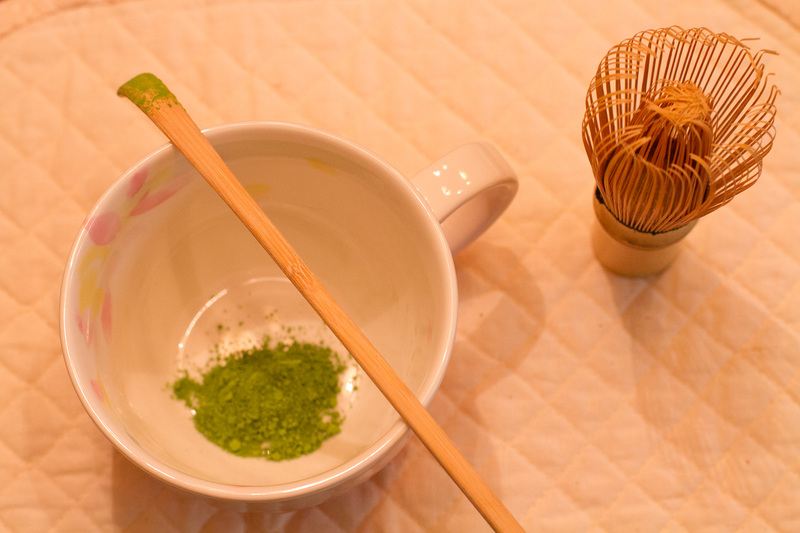 Matcha is a key component in Japanese tea ceremony. 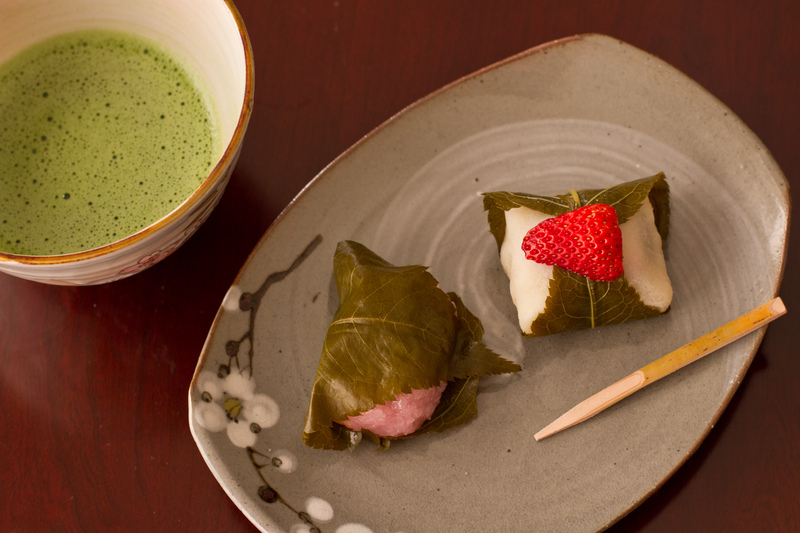 There are two types of matcha that can be served at a tea ceremony, koicha (thick tea) or usucha (thin tea). Typically, usucha is the tea that is served because it is lighter in flavor, each guest is served their own cup and it’s a shorter ceremony. Koicha is usually only served during formal tea parties and it is one cup served for all guests to share. It is typically served after or with wagashi (traditional Japanese sweets). Wagashi’s sweetness helps to counterbalance the bitterness of the matcha tea and according to my tea teacher, preparing the stomach for the intense flavor and strength. Matcha is best prepared using a whisk (purchase one here). Add a small amount of hot water and whisk briskly in a back-and-forth motion until foamy. Using a cup that is wider like a bowl and tilting it slightly helps to achieve the light foam. To master the art of making matcha, it should be very tiny bubbles. Matcha latte From Bon Appétit A good starter drink using matcha if you are not use to the bitterness. The almond milk sweetens it nicely! Bring 3/4 cup unsweetened almond milk, soy milk, rice milk, or cow’s milk to a bare simmer in a small pot over medium-high heat. Place 1 teaspoon matcha powder in a heatproof cup. Slowly whisk in 1/4 cup boiling water, then almond milk, tipping cup slightly to help create more foam. Sweeten with agave syrup. Matcha Coconut Latte from Love and Lemons Another delicious variation using coconut milk. Matcha Tiramisu from Oh How Civilized I love melding eastern and western flavors and it doesn’t get much better than this…a tiramisu where matcha is used in place of cocoa! Yum! Matcha Popcorn from Serious Eats Take your popcorn to a whole new level! This recipe will not disappoint. Matcha ice cream from Just One Cookbook Iconic Japanese dessert that can be found from local convenience stores to high end restaurants. Matcha muffins with white chocolate chips from Food + Wine I use to always grab a muffin similar to this in Hiroshima train station on my way home. They were delicious for breakfast, a snack or served with tea.